Danielle had some medical issues during this period but when she felt well enough she got some work done in her glass shop. All of these works were done with lead came. Danielle made this for our daughter and her husband. 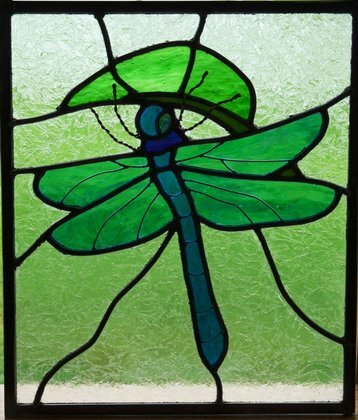 This is a dragonfly. This was Danielle's first work with copper wire overlays. The legs are off the glass with only the feet attached on the lead came. The wing and body veining wires lay on top of the glass. This piece was donated to a benefit action. During this period, Danielle worked on two Seattle Seahawks panels. She had to repair the original panel for our grandson, Tony, after some of its glass cracked when it accidentally dropped. She also made a new one that was donated to a silent auction. Danielle built this reduce size replica of the Judas church window for the pastor. He had told her that it was his favorite. The candles the church used were nearly burned out so Danielle built this set of 5 Advent candles. There is one for each Sunday in the Advent season plus Christ candle for Christmas Eve. They are about 4 inches square of varying heights and sit on black, wooden stands. They are lit by battery candles so there is no smoke from the flames to discolor the glass. Click the image on the left for a larger view. Below one sees the entire set on the left and the Christ candle on the right.